Bald Eagle And Red Fox Start Fight Over A Rabbit In Mid-air Caught On Video. There is certain wildlife photography that you can’t plan for - it is the result being in the right place at the right time. When this kismet occurs, however, the images offer incredible displays of the animal kingdom. Photographer Kevin Ebi has shared a dramatic footage of a bald eagle tussling with a red fox over who gets to feast on a rabbit—all of which took place in mid-air. 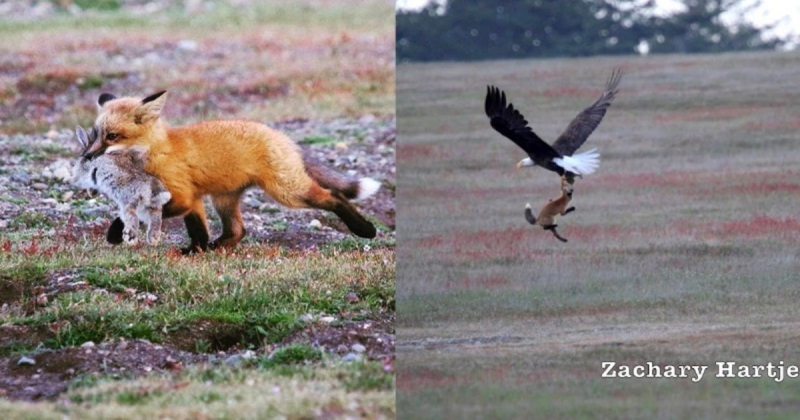 An eagle and a fox briefly battled over the same prey, with the tug-of-war going airborne. This video was captured from San Juan Island Historic Park in Washington state. The fox was seen running with a rabbit in the clutches of its mouth. It turns and looks in the direction of the incoming eagle, which swoops down, attempting to take the rabbit from the fox. But the fox did not let go, and the eagle lifts both species 20 feet up into the air. Moments later, the fox and eagle are fighting it out in a frantic mid-air battle to determine who will enjoy the bunny as its next meal. At the end, the eagle prevails, getting the rabbit, and the fox falls to the ground without dinner.